VEGA ZZ is a complete molecular modelling suite that includes several features to make very easy your research jobs. Snapshot view highlighting the real time graphic quality of VEGA ZZ package. Extreme OpenGL implementation for an incredible real-time rendering quality: lighting (4 light customizable light sources + ambient light), alpha blending, hardware anti-aliasing (if supported by the graphic cards), material management, SkyVision (3D backgrounds). Stereo view (shutter and anaglyphic glasses). 3D molecule view: wireframe with multivector bonds, CPK, ball & stick, stick, trace and tube. All representations can be mixed thanks to the new selection tool. Atom and bond selection & picking. 3D surface: dotted, mesh, solid, solid transparent. Thanks to the HyperDrive technology, the calculation is very fast, using multiple CPUs or the OpenCL acceleration when available. The surfaces can be colored by atom, residue, chain, segment, molecule, surface ID and property. The color gradient used in the property coloring mode can be customized by the user that can define the number and the type of colors. 3D interactive monitors calculated in real time (distance, angle, torsion, angle between two planes, hydrogen bonds and E/Z geometry). Simulation trajectory visualization and animation with full support for Accelrys archive file (.arc), AutoDock 4 DLG, BioDock output, CSR (Accelrys conformational search), DCD, ESCHER NG, GRAMM, Gromacs XTC, IFF/RIFF (32 and 64 bit), MDL Mol multi-model, Tripos Mol2 multi-model, PDB multi-model and PDBQT multi-model formats. Vector graphic rendering engine. It's possible to export the view in PostScript, Encapsulated PostScript, PDF, SVG, LaTex, POV-Ray and VRML 2.0 formats. The powerful lighting engine implemented in VEGA ZZ allows realistic views. All VEGA ZZ functions are available trough menu and/or requesters. Magnetic windows that can be assembled and managed as an whole large window. Possibility to load and save window layouts for specific operations. Buttons, radio buttons, combo boxes, list boxes, check boxes and sliders. Cut, Copy & Paste operations. Command console integrated in the main window. Undo and redo functions with multiple levels. Add solvent. Several solvent clusters are included: acetone, ammonia, CH2Cl2, CHCl3, formaldehyde, methane, methanol, octanol-water, POPC crystal, POPC liquid, water. Add ions (any type without restrictions). 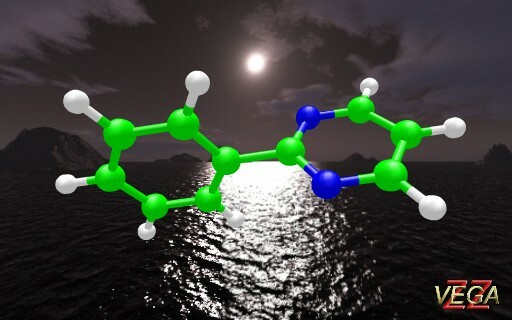 Add aminoacid side chains with chirality check. Add fragments & 3D molecular editor. Several fragment libraries are included as building blocks. 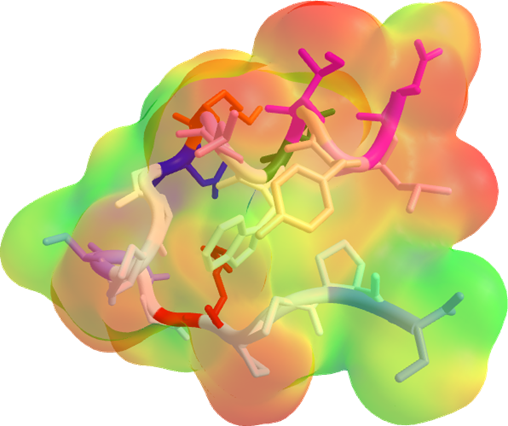 Peptide builder with the capability to specify the secondary structure. 2D molecular editors: Ketcher (included in the package) and ISIS/Draw. SMILES editor with automatic 3D conversion. Build molecules by IUPAC name (powered by Opsin). Atom type an charges attribution. Remove residues, segments and molecules. Connectivity builder and bond type finder. Change bond length, angle and torsion values. Atom constraints for molecular dynamics (atom fixing and harmonic constraints). File merge: VEGA ZZ is able to merge files in different formats, in order to take selectively coordinates, parameters, fields and properties of each file. Trajectory file manipulation: the MD flies can be converted in other formats removing/skipping frames. The supported output formats are: NAMD/CHARMM DCD, IFF/RIFF, Mol2 multi-model, Gromacs TRR, Gromacs XTC (the compression ratio is user-selectable), PDB multimodel and PDBQT multimodel. Print engine: VEGA ZZ sends the images to the printer at full resolution. Molecular mechanics & energy minimization provided by AMMP. The implemented minimization algorithms are: steepest descent, trust (modified steepest descent), conjugate gradients, quasi-Newton, truncated quasi-Newton, genetic algorithm, polytope simplex and rigid. Remote hosts can be used to increase the AMMP calculation performances. Molecular dynamics provided by NAMD (not included in the package, but available for free at http://www.ks.uiuc.edu/Research/namd/). The most common function are accessible trough the graphic interface and the simulation can be interactively launched in the VEGA ZZ environment. Analysis of molecular dynamics trajectory files (distances, angles, torsions, angles between two planes, dipole moment, gyration radius, ILM, MLP, lipole, PSA, RMSD, surface area, surface diameter, volume and volume diameter). Structure based virtual screening (provided by GriDock/AutoDock and AutoDock Vina). Protein-protein and protein-DNA docking (ESCHER NG). Graphic interface for Mopac 7.01 (included in the package), and Mopac 2007/2009/2012 not included but available at http://openmopac.net/MOPAC2012.html. Interaction analysis of ligand-receptor complexes. Interactive protein check (bond length, chirality, peptidic bond geometry, missing residues and ring intersection). Prediction of protein pKa values (PROPKA). Calculations of solvation free energy using the Langevin Dipoles solvation model (ChemSol 2). PDB interface to download the structures directly in VEGA (PowerNet plug-in). C script engine: you can create super-fast scripts in C language directly in the VEGA ZZ environment. They are built in real time by Tiny C compiler included in the package. PHP, Python and REBOL scripting languages for batch processing, multiple calculations and multiple host communication. All three interpreters are included in VEGA ZZ package. Ajax technology to integrate Web-based applications in the VEGA ZZ graphic environment (e.g. Java applets to edit 2D structures). Support for standard batch files trough SendVegaCmd command. Other languages can be used writing specific interface code. The standard VEGA command line version is included. Database engine (directory, IUPAC names, Merck MMD, Microsoft Access, Mol2 multimodel, ODBC, Sdf, SMILES, SQLite and zip support). Plug-in system to expand the VEGA ZZ capabilities. HyperDrive technology. It allows to take full advantages of multiprocessor systems, Hyper Threading and multi-core CPUs. Support for OpenCL technology.